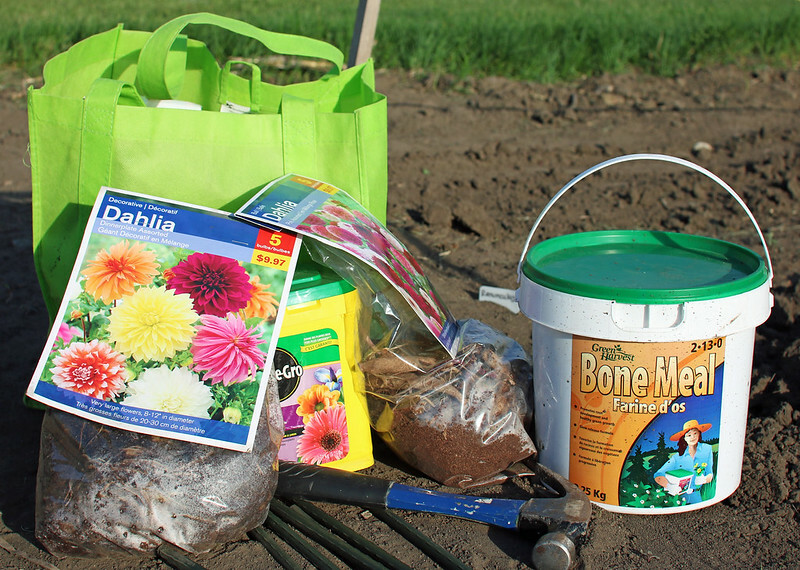 This will be my third summer planting dahlias and I have a lot of tips to share with you, from all the mistakes I’ve made. I say that proudly, because there’s always so much to learn and it always makes me look so forward to the next growing season so I can do better. 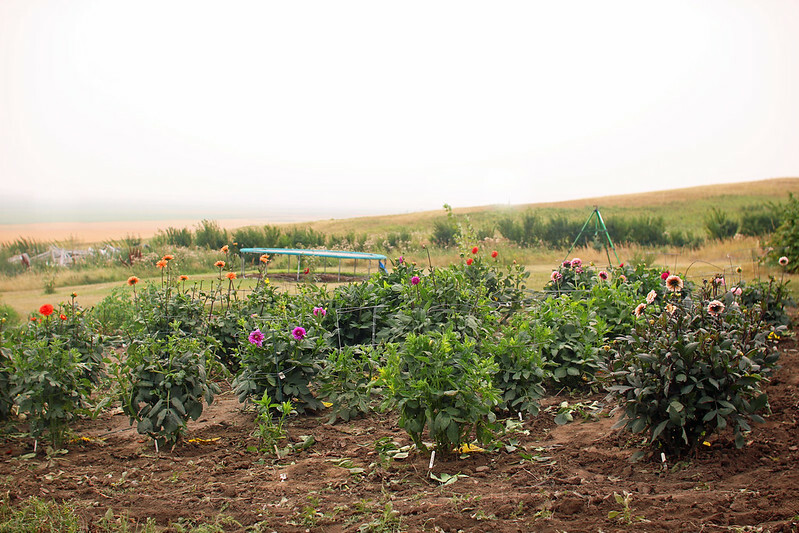 In my post about how to start a cut flower garden, I shared that you need to start planning your dahlia garden at the end of summer/beginning of fall, because that’s when you buy your tubers for the next growing season. If you’re looking to start from scratch this year, fear not! 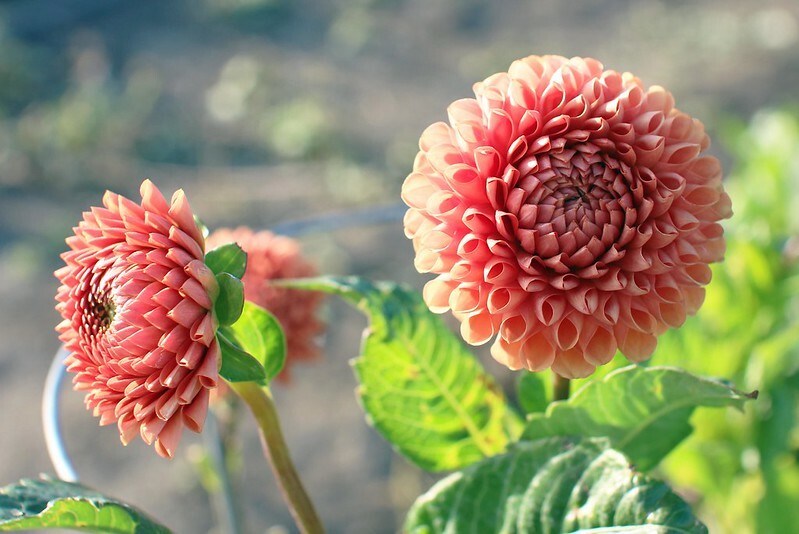 Garden centres, including Walmart, will have dahlia tubers available to buy, and so will Vesey’s and select growers will have stock available, but the popular varieties will likely be sold out. Once you have your dahlia tubers, you need to store them in a cool, dry place until you’re ready to plant them. As soon as I get mine in the spring, I pot them up and keep them inside, or if they are a late arrival at the end of April, beginning of May (depending on the weather, of course) I plant them directly into the garden, being in zone 3a. I know the second option might be tricky depending on where you live, but tubers are susceptible to rot if there is going to be a lot of rain and that rain is going to saturate the soil you’ve planted your dahlias in. 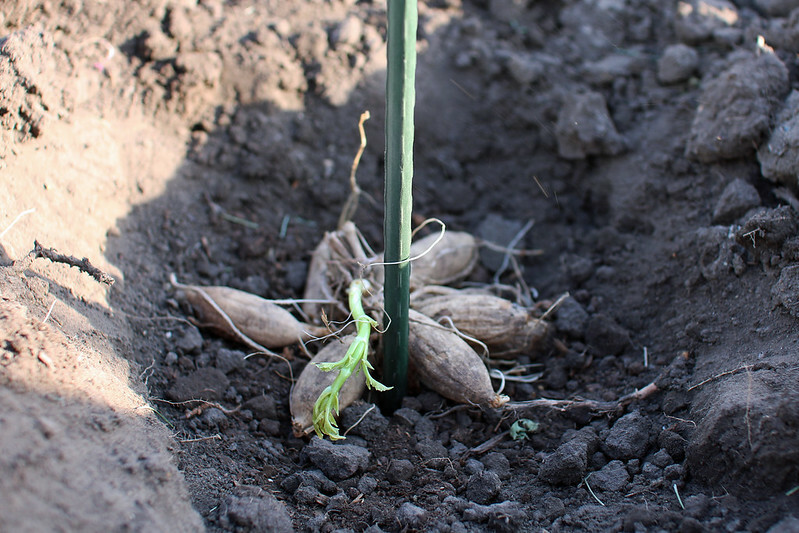 It’s important to plant your dahlias in well-draining soil. Dig a hole, place tuber in. Okay, it’s a little more specific, and there’s a few options for supporting these plants, but not much. Don’t forget to label, and you’re done! This is a nice, healthy tuber clump from Walmart that has the stem at the top with one eye that has clearly started to grow. Place it in the soil as I have it laying on my hand here and pinch off the growth, it will grow back and be a much stronger plant, I promise (even though I didn’t do it for this particular dahlia). 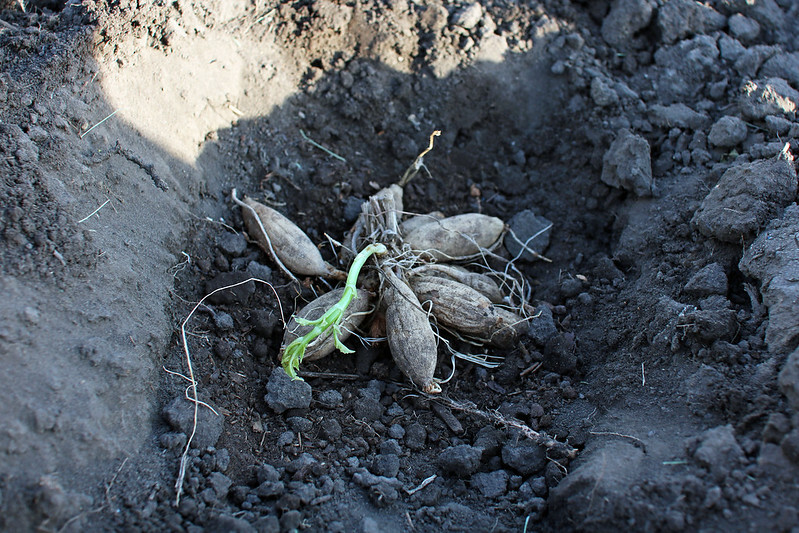 DO NOT WATER your dahlias until they start to emerge from the soil. Some even suggest not until they’re a few inches high! I give mine a little drink, but by no means am I absolutely soaking them. Be patient. Another hard item to do. I am VERY guilty of gently digging around my dahlias to see if they are actually DOING anything. Some varieties will grow CRAZY fast and some will lay “dormant” for 4 weeks or more in the soil. Just be patient and let them be. Seeing them poke through the soil is like Christmas morning! Feed them. 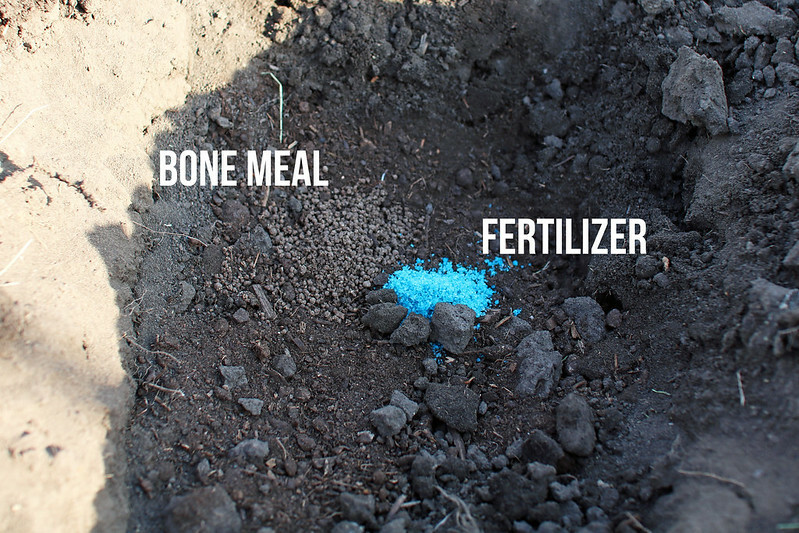 It’s a good idea to at least put some bone meal into the hole you’re planting them in, but then they need to be fed about once every 3-4 weeks as they grow. I have a 0-10-10 liquid fertilizer I use as well as a basic MiracleGrow garden fertilizer that I use. Water them. The past years I have grown dahlias have been very hot and basically drought like weather in southern Alberta. I water my dahlias every single day, even just a little drink, when it’s scorching hot out. I believe generally they need about 1″ of water per week. 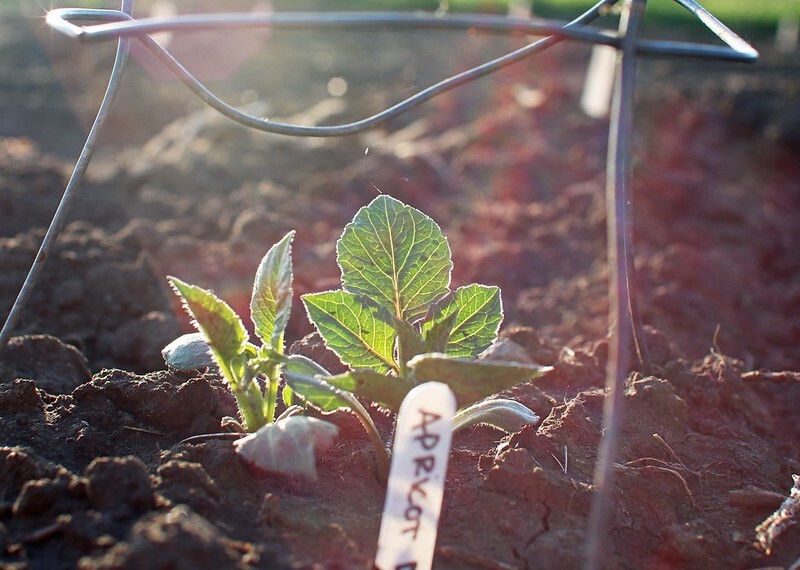 Drip irrigation is ideal, but I’m not quite at that phase of growing yet. Protect them. They love full sun and can tolerate a bit of shade, but they don’t particularly thrive in 38C+/100F+ temperatures. Luckily we don’t often get THAT hot here. They can get damaged by wind storms, I have found tomato or peony cages the best way to support them as they grow; I have NEVER had a dahlia plant grow >3′ tall, even when they’re “supposed” to, I just don’t think we have the ideal weather for that growth. Pinch them. It seems counter-intuitive, but trust me, it’s the opposite. 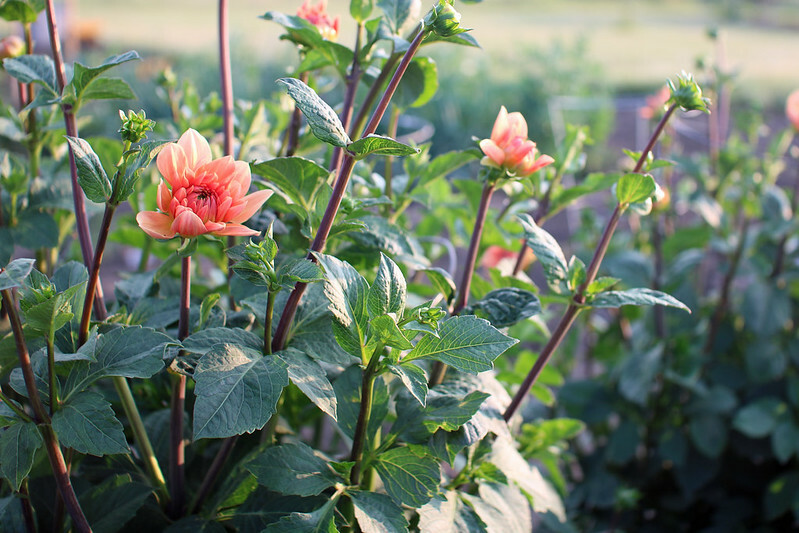 When the dahlia plant has 4-6 sets of leaves, pinch off the centre terminal growth. This signals to the plant to product MORE lateral growth and more flowers. Disbud them. As flower buds start to form, leave the centre bud and pinch off the side buds for longer, stronger stems if you’d like. 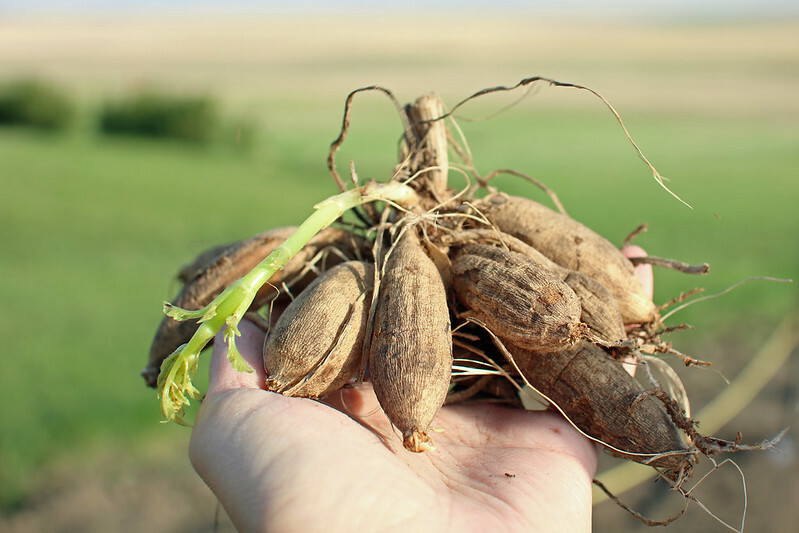 Harvest them. Don’t be scared to cut your flowers and enjoy them! They don’t have the longest vase life out there, but there’s nothing more rewarding than harvesting these beauties. The more you cut, the more they grow. If you decide to not harvest them, make sure you dead head them (cut off the dead flower) from the plant. Growing dahlias brings me SO MUCH JOY, and I hope I’ve inspired you to try growing them. I started with 10, last year I had about 45 and this year I’m going to be planting about 80! So addictive, in such a good and therapeutic way. 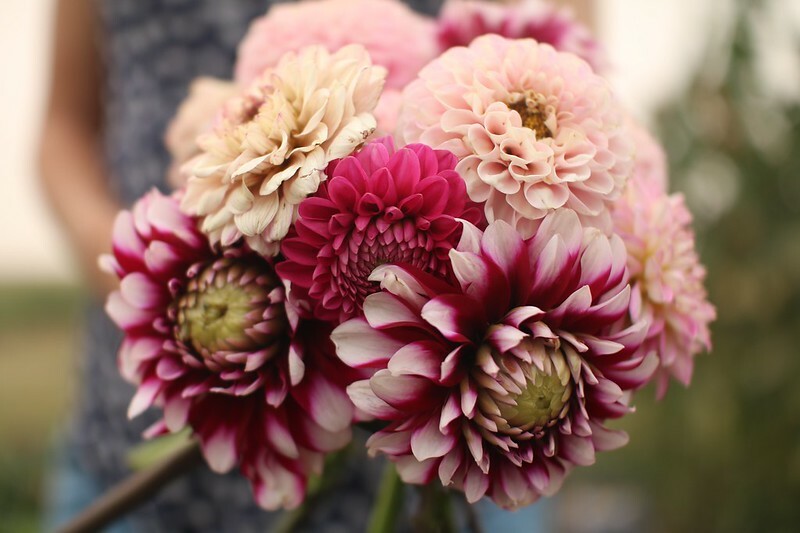 This is a very basic guide on how to grow dahlias, for a very comprehensive guide, check out Floret Farm’s Grow Great Dahlias eBook for free or buy her book Cut Flower Garden.